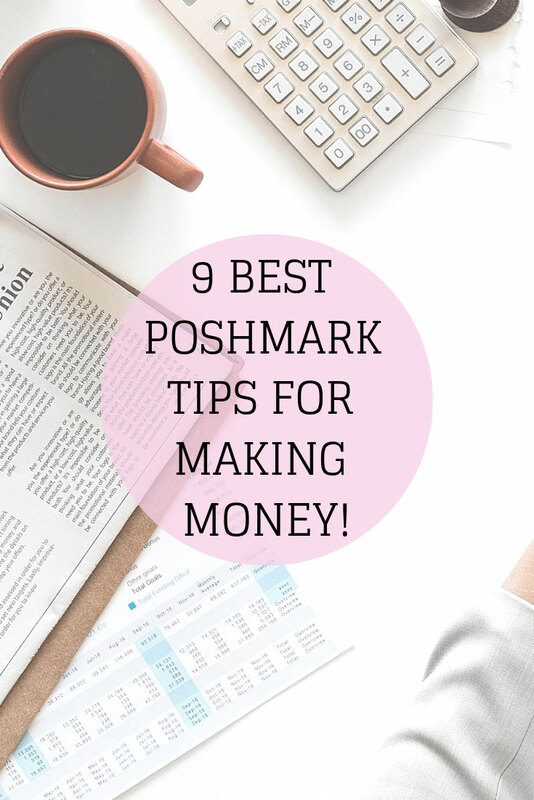 9 Best Poshmark Tips for Making Money! So you’ve decided to sell on Poshmark & are overwhelmed? Been there, got Poshmark tips for you. Not sure how it works with the social aspect unlike eBay..I get it, I didn’t get it at first. You want to understand the best practices when selling on Poshmark, well I’m here to give you my best Poshmark tips for making money! Ready for your first of many Poshmark tips? I feel like this is a given but be upfront & spell out any sort of blemishes. People can easily slide through photos & not see a stain/snag/blemish on an item. Type. It. Out. It doesn’t have to be a long winded explanation just a simple “dime sized stain on interior of cuff (see last image)” will do, along with a photo of it in the last of the images. I personally like to do it that way if there are any blemishes on an item I am backed up if the buyer doesn’t both read & look at pictures..believe me it can happen as a Poshmark seller. I’ve noticed that when selling on Poshmark, this makes all the difference in selling an item quicker. Give quick measurements for each item you sell. For tops/dresses give from armpit to armpit & length (shoulder to hem). For skirts give the waist laying flat & length. Jeans have the most measurements with waist laying flat, inseam, rise & leg opening laying flat. As fun as it can be creative with photos, it’s most effective (SEO wise) to just get to the point. Plain white backgrounds, good lighting (sit next to a window) & your iPhone will for sure do the job. I’ve invested in this lighting kit because I wake up before the sun does & have been shooting my photos at that time. My method to shooting items to sell on Poshmark is KEEP IT SIMPLE, clear photos that show exactly what is being sold. On a site that is one part social & one part buy/sell, you’ve got to do your social part to REALLY make waves to get sales on Poshmark. I share my closet atleast twice a day, yes I share my OWN listings…it felt really wrong/weird at first but that’s what you’re suppose to do. And when I see a party going on, I will share my related listings (so they pop up to the top of my feed for easy sharing) & then move on to sharing listings from the party. More times than not I get a ton of reshares on my items by doing this. I don’t bother with anything I can’t price at at least $25 because after Poshmark fees I make $20 & I make sure I value my time accurately. When reselling was my full time income I went more for quantity since I could push out listing after listing but since I am doing this as a side gig at the moment, I try to focus on items with a quick turn around or higher resell amount. Making rules for yourself is essential for creating a stream line reselling process. Creating a perfect title is as easy as can be, my go to title combo is: BRAND + What it is + Color + Material + Fit + Extra Details. Poshmark listing titles allow for fewer characters than lots of other sites so many extra details aren’t really too easy. Use keywords in your Poshmark listing description though. I like to use words like cozy, boho, minimalist, basic, classic, LBD, boho, distressed, vintage, festival that describe the item or style. Do NOT use brands at keywords, that is a sure way to annoy poshers. One of the most asked questions I get when people starting selling on Poshmark. 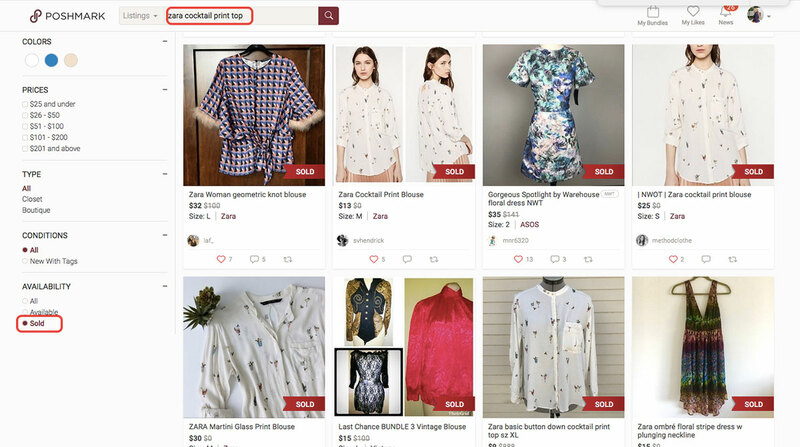 You can easily see what past items have sold for by searching for the item you have (Brand plus a few descriptive words) & then checking off the SOLD items to see only what has already sold on Poshmark plus for how much. EXAMPLE: I was searching for a Zara Cocktail Print Top I found at the goodwill bins. This is so easy but at the same time I automatically turn off notifications on apps because I can’t stand them but then I realized for selling on Poshmark they are a MUST have. From offers being made to knowing when you make a sale, having your notifications are a must. Especially with offers that expire in 24 hours! Ok here’s another fun Poshmark tip, you can get free mailing supplies from the USPS! Since everything ships through Priority mail you can get free boxes & mailing envelopes from the USPS to keep your costs down. I know that many people on Poshmark package a little more over the top with tissue paper, ribbon, hand written notes but that’s not my style so I don’t force it on myself. I do however add a bit of flair to my packaging if someone buys an expensive item. Want more Poshmark tips & hints to make $$? Check out my resell journey, how much I make monthly reselling on Poshmark & some of my best thrift flips!! These are awesome tips. I’m not the best at selling clothes and maybe this will actually help. Thanks so much for sharing! I’ve been looking to give thrifting a try as a side hustle, and this is definitely helpful!